Jeffrey S. Vender, MD (Clinical Professor, University Of Chicago, Pritzker School of Medicine) and Chairman of the clinical advisory committee to the Respiratory Compromise Institute (www.respiratorycompromise.org) discusses the benefits of early detection of respiratory compromise through continuous patient monitoring. "There are numerous situations where patients with underlying pulmonary disease are in very chronic, but stable conditions. And, for a multitude of reasons, either a therapeutic intervention, the administration of pharmaceutical agents, in particular sedative agents and/or narcotics, as you've alluded to, or an underlying disease, like pneumonia, can make this stable respiratory condition and move it down the spectrum of patho-physiologic deterioration into respiratory compromise." 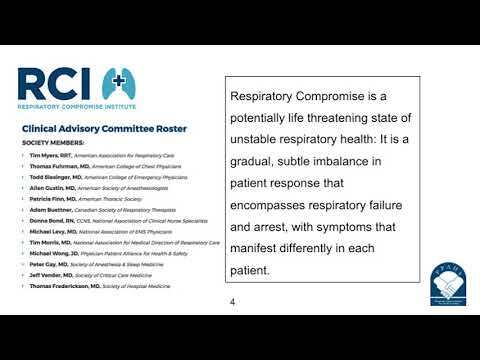 The Respiratory Compromise Institute defines respiratory compromise as "a potentially life threatening state of unstable respiratory health." Respiratory Compromise "is a gradual, subtle imbalance in patient response that encompasses respiratory failure and arrest, with symptoms that manifest differently in each patient." The podcast with Dr. Vender may be viewed on the PPAHS YouTube channel by clicking here.